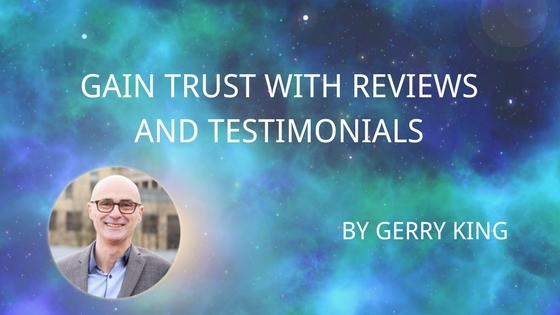 Can you Gain Trust with Reviews and Testimonials? Online reviews about local businesses, products and services have become an everyday part of life during the consumer buying journey, a growing number of us read online reviews before buying. Which confirms amongst other things that it’s not all about price! In this second of our series of articles discussing Top 5 Content Essentials on Your Website for Local SEO Rankings we look at Reviews and Testimonials. Reading reviews online is an important part of a consumer’s buying process, positive reviews result in us trusting a local business to the point where we believe online reviews almost as much as personal recommendation. We are also more likely to visit a company’s website after reading positive reviews. Online reviews are amongst the ranking factors that influence local search rankings as shown in studies by Moz and The Local SEO Guide. A page that shows an actual customer’s review about your business will be ultimately more valuable than a page where the you business owners says you are a trustworthy company. Reviews and highlighting of a company’s reputation will impact trust, real reviews from customers will for obvious reasons build a more trustworthy feel from visitors. More people will contact the business showing a direct relationship between reviews and the perceived trustworthiness of your business, online reviews demonstrating you as a business to be trusted. Getting online reviews is a great way to differentiate your business from your competitors and promote trustworthiness in potential new customers. The idea of filling your website with content that helps your clients is a sound approach – reviews help them with decision making! No matter how slick and on message your website content is if you don’t win the trust challenge the chances of success are slim. Your prospects need to trust you, they need to have confidence in your integrity before giving you their money so why not gain trust with reviews and testimonials? Strong testimonials will go a long way towards gaining that trust. Testimonials that provide a first and second name, a town and even a picture are strong. Testimonials can be so effective that simply having them on one ‘Testimonials’ page isn’t enough. Put them on your home page to make sure a visitor who might potentially go no further will see them. There are no rules as to where you can include testimonials, use your imagination and add them at key points throughout your website. If your business has a Google My Business page (and if it doesn’t be sure to find out if it can/should) point your customers to that page to leave reviews. That will provide a double whammy as those reviews will enhance your listing and you’ll also have ready-made testimonials to include on your website. Make trust your goal and see just how effective that can be. Highlight your customer testimonials with WPQuicklaunch. WPQ makes editing and creating website content easy, use the Quicklaunch platform to start your content journey.